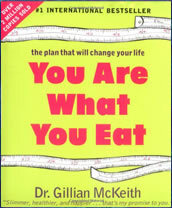 Internationally acclaimed holistic nutritionist Gillian McKeith is the author of You Are What You Eat. She has become quite popular through her television program where she offers dieting and nutritional advice to viewers. Gillian McKeith states that her mission is to ’empower people to improve their lives through information, food and lifestyle’. She regards weight loss as a by-product of healthy eating and encourages dieters to focus on improving their nutritional intake rather than the pursuit of weight loss as a goal. McKeith encourages dieters to adhere to a vegetarian diet for the first eight weeks of the program. Following this initial phase dieters may include small amounts of fish and organic chicken in the diet. She recommends that dieters follow the principles of food combining for better digestion. Fruit is to be eaten on an empty stomach with starches and proteins to be eaten at separate meals. Dieters are advised to eat small and frequent meals and to snack on fruit and vegetables when feeling hungry. McKeith advocates the use of fresh juices and raw foods due to their high nutrient and enzyme content. She also advises dieters to take digestive enzymes whenever they eat a cooked meal. You Are What You Eat also recommends that dieters start their program with a series of colon cleansers so as to support the detoxification of the body that occurs with the major dietary change that is generally necessary. Red meat, caffeine, sugar, refined grains, spicy foods, fatty foods, and alcohol are to be strictly eliminated. Fresh fruit and vegetables, fresh juices, sprouts, legumes, soy beans, nuts, whole grains such as oats and quinoa, fish, organic chicken, low fat dairy products, cold pressed oils, honey and maple syrup in moderation, herbal teas. More vegetarian recipes can be found here. You Are What You Eat recommends exercise as part of a balanced approach to long-term weight loss. She advises dieters to walk for 30 minutes every morning and to do 20 minutes of dancing or rebounding in the afternoons. You Are What You Eat retails at $16. There is also a Shopping Guide and Cookbook available. In order to follow the plan as recommended it would be beneficial to purchase a juicer and blender. There will also likely be a higher grocery bill due to increased requirement for fresh fruit and vegetables. McKeith also recommends the use of a variety of supplements such as digestive enzymes and blue green algae that may be expensive. Encourages a high intake of fruit, vegetables and whole foods. Encourages dieters to take a proactive attitude in regard to their health challenges. Provides information that dieters can use to identify specific patterns of disease in their own bodies. Includes a 7-day jump start plan and a one-day detox plan. Will probably require a complete overhaul of the diet with elimination of many foods. Dieters may experience caffeine withdrawal symptoms initially as coffee and tea is not allowed. Food combining is difficult to follow and has not been proven scientifically to have benefits for digestion or weight loss. Requires more time to be spent on food preparation. Recommends the use of several supplements that do not have adequate scientific evidence to support their effects. Some of the detox recommendations are potentially harmful. This is quite a rigid plan that will require a great deal of commitment in order to follow as recommended. It will appeal to the dieter who is open to new information and interested in applying natural remedies to improve specific health conditions. Dieters may experience weight loss as a result of improving the nutritional quality of their diet and increasing exercise. You Are What You Eat is likely to be too strict for the majority of dieters but for those who enjoy this style of eating it may be maintained as a balanced long-term health supportive weight maintenance plan. im going to try this diet and see what happens! bikini season here i come!! I am unfamiliar with the site and book but serious about my weight. It is serious that I lose this “extra baggage”. What is sad is that I have gained more since I’ve been in college.Is there another diet plan I can use beside this one? ?